Downsizing can free up time spent on home upkeep and give you more time to pursue other things you enjoy, such as hobbies, traveling or family bonding. Do you want to cut expenses? A smaller place may help trim costs, such as mortgage and insurance payments and utilities. But remember to consider the costs associated with selling a home, including realtor fees, closing costs and moving expenses. Does your home meet your needs? You may look for a home with living spaces on one floor, a smaller yard, or a closer proximity to city life. While you may be able to adapt your current home, moving to a smaller home may be more convenient. Do you want to improve cash flow? Selling your home may give you extra cash to put toward retirement savings or free up a portion of your monthly expenses. 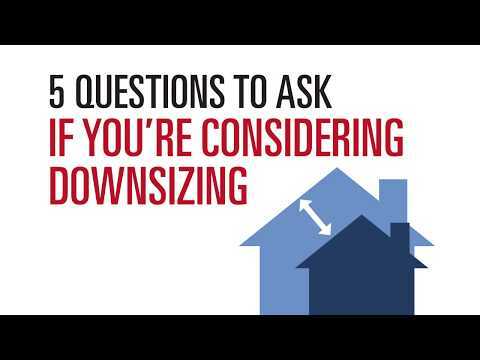 Downsizing from a $250,000 home to a $150,000 home could save about $6,250 a year. Do you need room to host? The right-size home for your family may depend on if you anticipate adult children or other relatives moving in with you or frequently hosting visitors. As with any plans for the future, don’t rush into the decision. List the pros and cons and discuss budgets, cash flow and retirement plans with family and financial helpers. If you're looking to sell, you'll want to read this before you start counting your capital gains. It's an affordable housing category with confusion about types. Learn them here. Ideally, retirement would be worry-free. Here are tips towards retiring with less debt. Getting ready to sell your home? These little improvement projects could give you big returns.